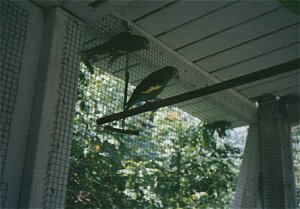 Colony breeding is something that is best done in an aviary. Nestboxes should obviously be provided for each pair but you should also throw in 2-3 extra so the birds can have their pick. Unused boxes can always be removed once everyone has settled in. Several feed stations and water dishes should be placed in various locations to avoid fights. Never place one nestbox or perch higher than the others because everyone will want to use it. Nestboxes should all be at the same height. Perches can vary in height as long as there are more than one "highest perch." Keep in mind that you'll be feeding a single diet. Birds that require special foods should not be kept in a colony. Likewise, if you have some picky birds or seed junkies you'll have to feed seed. You can try offering pellets in hopes that your junkies will learn to eat them from your other birds. However, even pellet eaters will usually eat seed instead of pellets if they are provided. The good news is that everyone learns to eat soft foods very quickly. The best same species colony is one containing budgies. 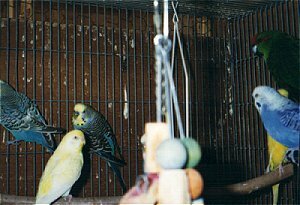 In fact, budgies are the one species that breeds best in colonies. Keep in mind that with this type of colony you'll get a lot of cheating between pairs. If you want strict control of your bloodlines this set up is not for you. I personally don't like this type of colony because most birds that can be bred in it can also be bred in a mixed one. This is how I breed. 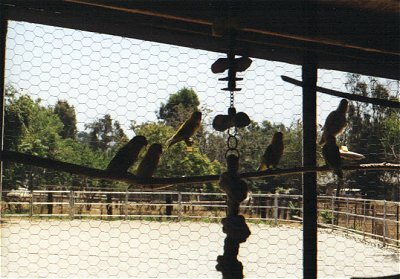 Most of the Australian keets like budgies, cockatiels and Neophema can coexist fine with similar species. Very closely related species shouldn't be kept together to prevent hybridization. 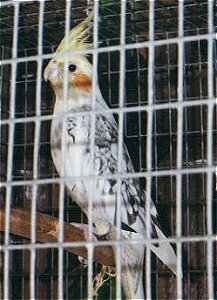 The trick to a mixed colony is keeping birds of similar size and temperment. You want calm, small birds that aren't likely to pick fights with their neighbors. Some birds just can't be bred in colonies. These birds may be fine in a non-breeding colony but will become very aggressive towards any other birds when nesting. They may nip off toes (make sure there they can't get to the birds in the cage next door), maim or kill. 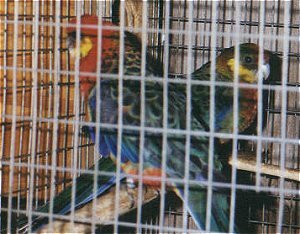 Aussie keets that should be avoided are red-rumps and rosellas. Parrots are also a no no.